Located three to four hours from Oslo, access to the Jotunheimen National Park is a breeze, making it one of the most popular ski touring destinations in the country – particularly in spring when the snow conditions are at their best. Jotunheimen (which means "the home of the giants" in Norwegian) is characterized by a varied landscape with expansive mountain plateaus and steep couloirs, offering an accessible challenge for ski touring enthusiasts of every level. The diverse terrain also makes it a popular destination for Nordic skiing, kite-skiing and cross-country skiing. The most enticing route for winter adventurers however is the Haute Route (Høgruta), which includes eight glaciers and seven two-kilometre summits. It is a six-day randonnée that encompasses nearly 80 kilometres of remarkable ski touring terrain, including a total of seven kilometres of steep descents. Each stage is approximately 15 kilometres with elevation gains of 1,000–1,500 metres over some of the country’s most iconic peaks – including Norway’s highest summits, Galdhøpiggen and Glittertind. The route includes five sleep-overs across a selection of mountain cabins run by the DNT (the Norwegian Trekking Association). Extending a warm welcome and an authentic taste of mountain culture, many guests are surprised by the size and comfort offered by DNT accommodation. Jotunheimen also has a wide selection of full-service hotels and mountain lodges, so this region is a great option even if you are not ready to take on the Haute Route. Last but not least: Stay safe and find out about the avalanche risk before you set out. You can check the avalanche forecast for Jotunheimen at varsom.no. 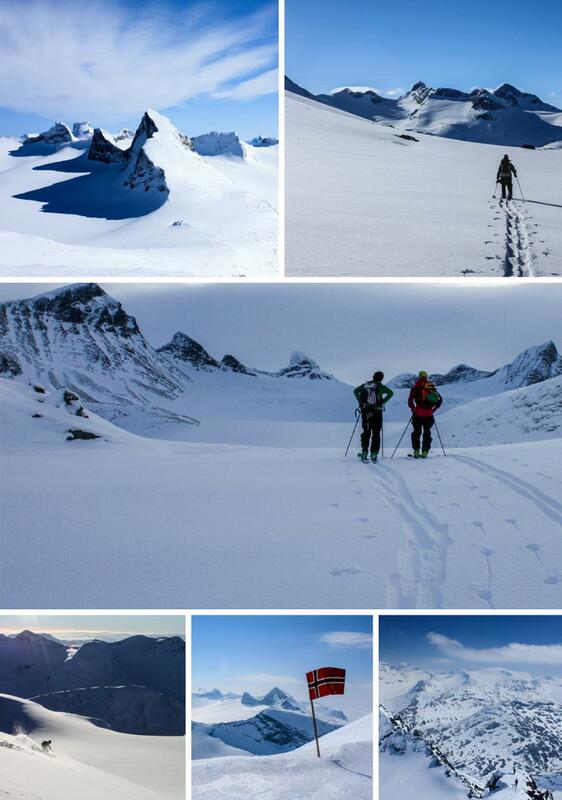 Read more about the Haute Route in Jotunheimen. Dyrhaugstinden (2,147 metres): A Hurrungane classic along a ridge with many vertical metres and a beautifully exposed summit. Crampons and ice axe are needed to reach the top, so an option is to turn at the smaller Nordre Dyrhaugstind. Jotunheimen is a huge and somewhat desolate area, and you should be prepared for the fact that eateries and bars are both few and far between. See all your options for eating and drinking in the Jotunheimen area. You will also find something in the Jotunheimen area if you are into art and culture: Stave churches, chapels, art galleries and museums. See all cultural attractions in Jotunheimen. Try something more than just ski touring while you are in Jotunheimen - winter options include dog sledding, snow shoeing and artsy visits to the regional museums. See a complete list of activities in the Jotunheimen area. 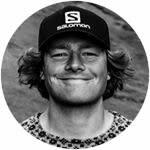 Joakim Dokka is a ski touring enthusiast with a preference for Jotunheimen: "Especially the west part of Jotunheimen is one of my favourite places for ski touring in Norway", he says, "where we have the beautiful and remote valley of Leirdalen with massive peaks on each side. The Smørstabbtindane peaks are fun to ascend, descend and rest your eyes upon". He also recommends going further west: "The steep mountain massive Hurrungane has a high alpine environment with 23 peaks over 2,000 metres. If you want to add an extra dimension to the ski touring, go even further north", he says and concludes, "to be able to ski to the sea, Lyngen is the place to be". "I would recommend visiting these areas in late winter and spring, because the accessibility is quite scarce in the middle of winter (closed roads and less daylight)." Explore the unmistakable landscape of Jotunheimen as captured by local ski touring enthusiast Joakim. Get in-depth travel information at the National Park Region&apos;s official website. By car, follow the E6 from Oslo or the E16 via Lærdal from Bergen. The Sognefjellet Mountain Road usually opens again in late April, giving you access to many interesting runs in the area. There are car rental companies in most bigger cities and entry airports in Norway. The Jotunheimen area can also be reached by express buses from Oslo, Bergen, and Trondheim several times per day. From Oslo or Trondheim, take the train to Otta – the nearest train station to the skiing terrain in Jotunheimen. From there, you can take a local bus to several places in the Jotunheimen area. The nearest airports are Oslo Airport Gardermoen and Trondheim Airport Værnes. You can travel by train from both airports to several destinations in the Jotunheimen region. If you prefer your own car, there are several car rental services at both Oslo Airport and Trondheim Airport.